In the northeastern corner of Alabama on Lookout Mountain, near the town of Mentone, in DeSoto State Park, you find the most magnificent waterfall in Alabama, DeSoto Falls. Dropping 104 feet into the west fork of Little River, these pristine headwaters meander a few miles downstream to find their way into the heart of Little River Canyon. Just above the falls stands a twenty-foot high dam, built in the 1920's by a brilliant, self-educated electrical engineer, Arthur Abernathy Miller. It was created to help supply power for his hydroelectric generator which was constructed below the falls. Today, if you cross the dam and take the trail down to the site, you find remnants of the concrete base where power was generated to supply the Alabama towns of Fort Payne, Mentone, Valley Head, Collinsville and Menlo, Georgia. Miller and a partner also bought 300 acres surrounding the falls to divide into building lots with plans for a community. Included in the plans was a park at an old fortress below the falls. The great depression, no doubt, played a big part in the demise of the project. 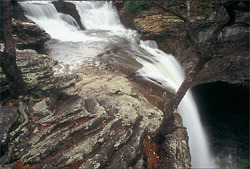 Today DeSoto Falls is open to the public with minimal barriers. If you want a picture of the falls at the crack of dawn, there is no gate to bar your entrance. Except for a couple of warning signs and some old railings, you are free to enjoy the area in its natural state. I have seen young kids scamper across the narrow dam and I've seen a teenager in need of attention, disappear over the edge of the falls to stand on a narrow rock ledge. It is a dangerous place for those who abandon caution. Occasionally someone jumps from the falls and is seriously injured and I've heard of one recent death. I can't commend the park service enough for preserving the natural beauty of the area instead of installing chain length fence or some other atrocity for the sake of safety, like they have at other parks in Alabama. 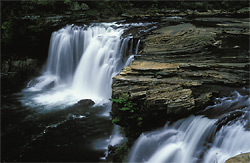 DeSoto Falls remains a landmark of Alabama's natural beauty. The caves are usually referred to as the Welsh caves. There has been speculation by historians that the caves were built by Prince Madoc, a Welsh explorer who may have landed in Mobile Bay in 1170. Some, however, totally disregard the idea. Although the possibility can't be ruled out, much of the speculation has been driven by folklore and wishful thinking. In 1850 when Pickett examined the caves and what has been termed a "fortress" made of piles of stones in the river bed, he found no evidence of anything other than the work of natives. A precarious, 90 foot trail leads to the caves and, in places, is only wide enough for one person. It can be slippery and the drop-off is around 325 feet. Most of the rocks observed by Pickett in 1850 at the ruins of the fortress were removed by stone masons to build the dam above the falls and probably homes. 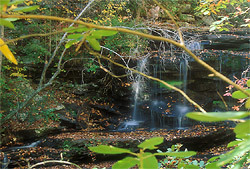 The site of the DeSoto Falls fortress is now owned by the State of Alabama who, along with the owners of surrounding private property, watch over and protect the area. It is not open to the public. Originally established in 1935, DeSoto State Park was created on 950 acres of land donated by citizens of Fort Payne and Mentone. 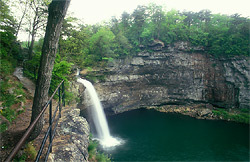 DeSoto Falls is within DeSoto State Park and the park itself sits within the boundaries of the Little River Canyon National Preserve. DeSoto State Park was voted one of America's top 10 state parks by Camping Life Magazine in their April 2006 issue. 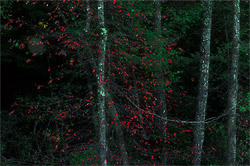 After visiting nearby DeSoto Falls, you might want to take a walk along the 1,000-ft. Azalea Cascades Boardwalk Trail. The park has around 12 total miles of trails. Over 900 species of wildflowers grow in northeast Alabama and DeSoto State Park is home to many common and unusual wildflowers. The peak time for viewing the popular rhododendron and mountain laurel is historically, the third week of May. Wildflower peak is normally the last two weeks in April through the middle of June. DeSoto State Park offers overnight accommodations from primitive campsites with electrical hookups to rustic cabins, modern chalets and motel rooms. There is even a pool and tennis court managed by the Alabama park system. Whether you plan to spend the night or not, after a day of exploring the area, I recommend supper at the lodge restaurant. 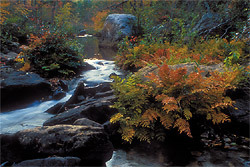 Little River is the only river in North America that runs virtually its full course atop a mountain. It forms on top of Lookout Mountain and reaches its base twenty-four miles later. Along the way, you can find drops over 600 feet from the top of sandstone cliffs to the canyon floor. 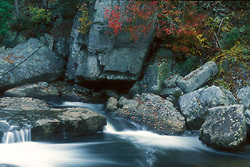 Little River Canyon is one of the deepest gorges in the southeast and Little River is one of the wildest and cleanest rivers in the southeast. After leaving the canyon, it flows into Weiss Lake and on to the Coosa River. If you are coming from Fort Payne, the nearest city, take Ala 35 up and over the mountain until you cross the bridge at Little River. Here you find Little River Falls which marks the beginning of the canyon. It is easily accessible with parking and a restroom. There is a paved walkway to a platform overlooking the falls. At low water levels visitors enjoy walking around the dry areas of the river bottom just above the falls. This is one of Alabama's most scenic waterfalls. 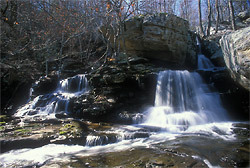 The calm upper stretches of Little River flow through forested back-county until they reach Little River Falls. The river is accessible for swimming or canoeing. 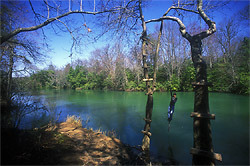 Blue Hole is a popular swimming hole a few hundred yards upstream from the Little River Falls. There is a little side road to pull off of Ala 35, to park by Blue Hole. 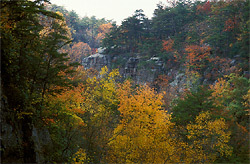 Below the falls, on the southern end of the preserve, there are only a few access points to the deep canyon. In the winter and early spring it offers class III and VI whitewater for expert kayakers. I once walked down the river from the falls until I could see the power lines crossing the canyon at Lynn Overlook. I had hoped to cross the river and climb up where I had previously found a way down, but there was no way across the water without risking getting my camera soaked. A memorable sight along this trip was an unusually round boulder in the middle of the rapids about the size of a bus. After you visit Little River Falls, cross back over the bridge and turn left onto Ala 176. This is the start of Little River Canyon Rim Parkway, Alabama's most scenic drive, which runs along the west rim of Little River Canyon and ends at Canyon Mouth Park. It features a number of spectacular overlooks. You find picnic tables and split rail fences, but some of the more interesting views are along short trails leading from the maintained overlooks. The main portion of the parkway is well maintained with winding curves and each overlook compels you to stop and see if it is more spectacular than the previous one. If you are willing to expend the effort to hike down to the bottom, you will have a better perspective of the view from the top. After you drive about a mile down the parkway, you come to Lynn Overlook. If you walk the rim of the canyon back in the direction you drove, you'll soon find a way to climb down the bluff to the canyon floor. Few people will want to take this rough way down, but it is one of the few ways down. There is no trail and when you get to the bottom you should find a marker to remind you where to go back up. There is only one place to climb back out. I have gone alone into remote areas of the canyon several times, but don't recommend it. Like many such places in Alabama, there is no cell phone reception. If you have an accident and can't climb out, you could be in serious trouble. Continuing along the canyon rim parkway, just past Lynn Overlook on the other side of the road from the canyon is Beaver Pond Trail. This three-quarter mile loop is said to be popular with bird watchers. It leads to a pond where beavers have made dams and a variety of birds reside. 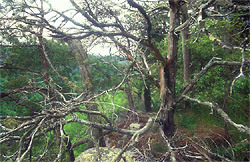 It is an easy trail through wooded and open areas. If you want to take pictures of the canyon, there are a number of picturesque views along Canyon Rim Drive. However, bear in mind that you will be covering the same photographic territory as hundreds of thousands of others before you. I have noticed that even when out-of-state professional photographers shoot the canyon, they tend to come away with the same pictures everyone else does. If you want unique pictures, make some effort and hike sections of the canyon floor. In the dry summer there are sections that are easily accessible. When the water is higher, be prepared to wade back and forth through water if you plan to go far. During wetter seasons, much of the canyon is impractical to hike. Following the canyon rim parkway, not far past Lynn Overlook you pass over Brooks Branch and there is an unofficial overlook where three or four cars can park. There is a way down to the branch and on to the river. After periods of rain it is a nice place to photograph. The first step down from the overlook, maybe 10 ft, is the most challenging step because you have to utilize a tree trunk beside a stone wall to climb up and down. A nice little waterfall which is just below the road marks the head. There is no trail. You just follow Brooks Branch to the river. It isn't far, but getting there involves climbing around boulders and hopping rocks across the branch. It is not for everyone, but when water is flowing it is a pretty area. You should take something to drink any time you hike into the canyon. Following along Canyon Rim Parkway, shortly after you pass Mushroom Rock, which sits in the middle of the road, you come to a small pull off with a park service sign to Lower Two Mile Trail. This is a well established trail. It is a steep .2 mile hike to the bottom and a favorite put-in for kayakers in the spring. If it is your first time to hike to the canyon floor, this might be a good choice because of the short distance. Continuing along the parkway, after several overlooks you eventually come to Crows Point. It is one of my favorites. Down below, Bear Creek Canyon joins Little River Canyon. You can look across the canyon to Eberhart Point. 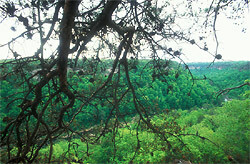 Not far past Crows Point is an overlook to Grace's High Falls, the highest waterfall in Alabama, falling 133 feet. It is a seasonal waterfall, hundreds of yards in the distance across Bear Creek Canyon. It offers a nice view in the springtime before foliage blocks the view, but in the dry summer and fall there is no falling water to see. If you want to experience the beauty of these falls, you can hike down into the canyon after spring rains. Few people attempt this because it is not easy. On my first attempt, from Little River Canyon up Bear Creek, I eventually reached water that was too deep to cross. On my next attempt I spent several hours hiking down Bear Creek Canyon to the falls. I eventually found a shortcut which can make your trip much easier. The shortcut along with photos and an account of my trip are here: Grace's High Falls. Further down Canyon Rim Parkway on the other side of Bear Creek Canyon is Eberhart Point. This overlook has picnic tables, a rest room and a barbecue grill as well as some of the canyon's nicest overlooks if you walk down the paths past the official overlook. 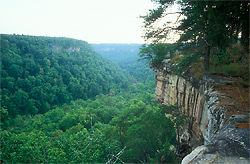 A three-quarter-mile trail leads to the floor of Little River Canyon and is well used. This is the easiest way to get to the canyon floor. It is not the most scenic path down but it is wide and well maintained, suitable for anyone with the will. Kayakers use Eberhart trail as a take-out or as a put-in. Downstream is seven or eight miles of long flatwater, broken up occasionally by class II and III rapids, with one class IV that can be easily portaged. Along the river an unmaintained trail leads all the way to Canyon Mouth Park. It is not well defined and in some places there seems to be no trail at all. Some of it is fairly rugged hiking and requires crossing the water. Also, at the bottom of Eberhart trail, you can walk up Little River to Bear Creek Canyon and on to Grace's Falls when the water is low enough. The problem is, when the water is low, the falls aren't very impressive. 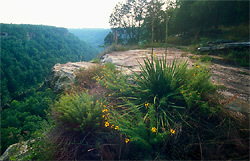 In the dry summer you can explore many areas of Little River Canyon that are impossible during wet seasons. It is a very different experience at different times. The best of the Canyon Rim Parkway ends at Eberhart Point. The lower, CR 275 section of the parkway was once paved, but is no longer maintained and full of potholes. There are no major overlooks, however there is Powell Trail a put-in for a class II canoe trip to Canyon Mouth Park. It is longer than Eberhart trail and unmaintained, but well used and more aesthetically pleasing. It is also good for a strenuous six mile, day long hike to Canyon Mouth Park. Or you could hike up river from Powell Trail to Eberhart Point. Nowhere in the canyon are you allowed to stay overnight. Canyon Mouth Park. After leaving Eberhart Point, you can avoid CR 275 and still reach Canyon Mouth Park by waiting and turning left onto CR 127. It will come back into CR 275 where you will then turn right. This soon brings you to Johnnies Creek and Johnnies Creek Falls. Going down the mountain here involves the steepest section of road I've seen in Alabama. After Little River flows out of the canyon it passes through Canyon Mouth Park. This day-use facility at the bottom of the mountain includes a restroom, running water, picnic areas with barbecue grills, a beach area and a mile long trail. 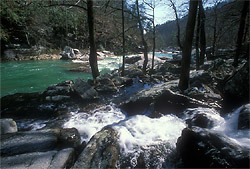 This is the place to go when you want to pack a picnic basket, take the family sunbathing, wading, hiking, barbecuing and enjoying the outdoors in a park setting.b It is a popular swimming area and marks the end of the 14,000 acre Little River Canyon Preserve, one of the most impressive natural wonders of the south.